Well, I still enjoyed this one, but it was nowhere near as good as the first book. 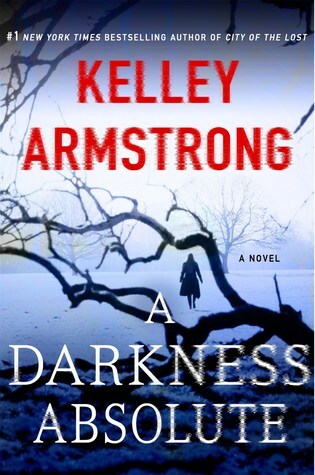 A Darkness Absolute is the follow-up to the brilliant City of the Lost, continuing Kelley Armstrong’s new mystery suspense series starring an ex-homicide detective named Casey Duncan. Months have passed since Casey first came to Rockton, a secret community nestled in the remote wilds of the Yukon. People come to this town to escape their past lives, expecting a safe haven, but the reality is much more sinister. As we saw in the previous book, not everyone in Rockton is who they say they are. Now our heroine is on the case again, partnered with her new boyfriend, Rockton’s Sheriff Eric Dalton. Winter has arrived with a vengeance, driving some of the townspeople stir-crazy with cabin fever. One night while Dalton is away on a supply run, one of these listless residents decide to do a runner in the middle of a snow storm, leaving Casey and Deputy Will Anders with no choice but to follow in an attempt at search and rescue. While taking shelter in a nearby cave system, they are shocked when they discover a terrified and malnourished woman trapped in a hole. They are even more horrified when they find out her identity—a former Rockton resident named Nicole, who has been missing for more than a year. This whole time she had been held captive in these caves by an unknown assailant, being subjected to unspeakable acts of abuse. The mystery deepens further when Casey returns to the cave system to look for clues about the perpetrator, but instead finds the remains of two other women. Rockton’s worst fears are confirmed: there’s another killer on the loose. It’s not clear yet whether the one they’re hunting for is a resident or an outsider, but now that Nicole has been rescued, Casey and Dalton must solve the case before the killer can target another victim. City of the Lost was my first book by Kelley Armstrong, and I fell instantly in love—with the story, the characters, the setting…with ALL OF IT. It made me excited for the sequel, hoping for the same kind of magic, but unfortunately it just wasn’t there. Don’t get me wrong, because A Darkness Absolute still ended up being a good read, but compared to the first book, something definitely felt lacking. So, what went wrong? It was likely a bunch of little issues compounded together, but if I had to point my finger at one thing, it was the story’s predictability. I guessed the perp even before the halfway point, and so the rest was watching Casey, Dalton, and Will run around in circles following leads that I knew would go nowhere. Turns out, reading a book like this can feel really tedious. Worse, when looking at the plot from this point of view, the repeated failures only made Casey and her team seem more incompetent. I also thought the mystery lacked imagination, at least when compared to City of the Lost. Sure, Armstrong threw out some red herrings and a few other distractions to try and complicate things, but I was able to sniff them out from a mile away. Obviously, your experience with this book may differ. After all, I probably stumbled upon the answers by pure chance, especially when I’m usually terrible at figuring out who the killer is in all these other whodunits. Taking out the mystery, there’s still a lot to like about this novel, not least of which are the characters and the exquisite atmosphere of the Yukon. A town like Rockton is the perfect setting for a psychological suspense mystery like this, where the isolation only heightens the tensions and the sense of foreboding. Add to that, every resident in town is an unknown factor, since no one likes to share anything about their past. There’s also no fancy forensic equipment or technology in Rockton, so Casey and Dalton have to do their jobs the old-fashioned way. And speaking of them, I continue to enjoy their relationship. The author has dialed back on the romance big time, or at least struck a better balance so that the drama was spread out and not dumped on us all at once like in the first book. A Darkness Absolute is also…well, dark. It can be difficult to read these books. People find themselves in Rockton for many reasons, but a lot of them end up there because they are the survivors of violence or abuse, and disappearing into the northern woods is their only chance of escape. We are exposed to a lot of their stories, many of which are troubling or unhappy. It only gets worse with a deranged killer on the loose, and many of the descriptions of what happened to Nicole and the other women can be downright disturbing and chilling. Bottom line, A Darkness Absolute was a good, if sometimes frustrating, read. I personally found the story way too predictable for the book to be a satisfying mystery, but I still love the series’ world and characters. I’m not about to give up on Casey Duncan, and I look forward to the next installment. This one sounds very chilling- that premise. Sorry to hear it was a little lacking. And it definitely sounds dark! I love the Yukon setting and I’m hoping to like it but I will definitely go in better prepared from your review! It’s probably just me! If I hadn’t guessed the story’s outcome, I have no doubt I would have liked it a lot more. I definitely enjoyed this one more than you did, but I completely agree: the mystery was pretty frustrating at points. I just wanted Casey and co. to make some real progress in their case before the 300 page mark! Getting to know more about Jacob was awesome though, and I’m definitely intrigued to see how Matthias plays into the series arc. Yeah, the mystery did seem to drag on a bit, didn’t it? I didn’t notice such a slowdown in the first book, except for when the story took a few chapters break to build the romance. It seemed like they went around a lot in circles in this one though. Lots of false starts and obvious red herrings.